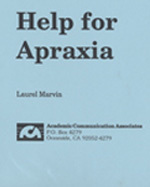 This booklet provides information to families about apraxia of speech and the effect that this disorder has on communication. Information about treatment of the disorder is included. You receive 10 copies of the booklet.